The Dean Ateneo School of Government posts this question in reaction to an article related to the Independence Day celebration. Antonio Gabriel Maestrado La Viña is a "Filipino lawyer, educator, and environmental policy expert. 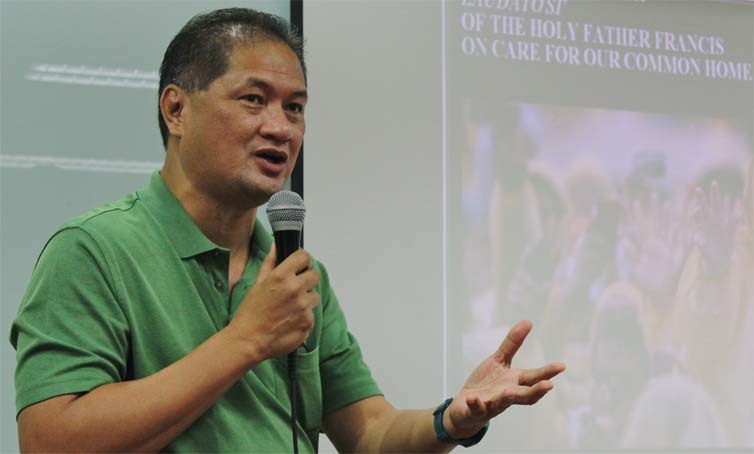 A former Undersecretary of the Department of Environment and Natural Resources, he currently sits as the dean of the Ateneo School of Government." Despite his credentials, La Viña still dared to ask what is too obvious. You don't need super human powers to understand why a country's leader is ditching a wine party at the height of a war. The traditional vin d’honneur to commemorate Independence Day has been cancelled as President Rodrigo Duterte wants to focus on efforts to resolve the terror crisis in Marawi City, Malacañang announced Friday. The President has spent most of his time in Mindanao since the crisis began, engaging troops in various camps in the south. 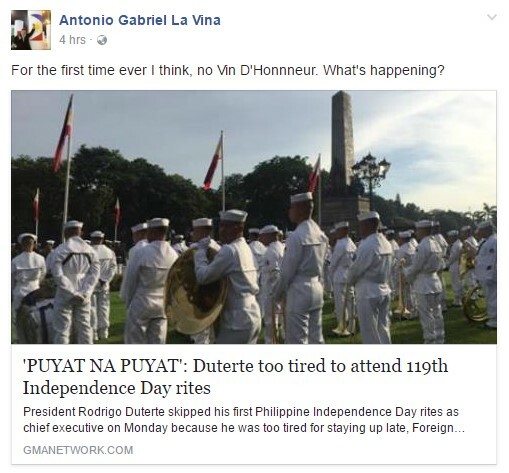 "The vin d'honneur scheduled on Monday, June 12, has been cancelled... the President will attend to matters pertaining Mindanao," said Abella. Clashes between government troops and extremists erupted in Marawi City on May 23, as state forces attempted to arrest top Abu Sayyaf leader Isnilon Hapilon. Local terror groups had planned attacks days earlier, as seen in a video obtained by the military. More than 200,000 residents have fled the city, while at least 209 have died, among them 134 terrorists, 45 troops and 30 civilians. The clashes prompted Duterte to place the entire Mindanao under martial law. La Viña's recent statement basically proved his elitist mindset.